an excellent full Thanksgiving Meal. click this box for more details on being a sponsor, personally or as an organization. 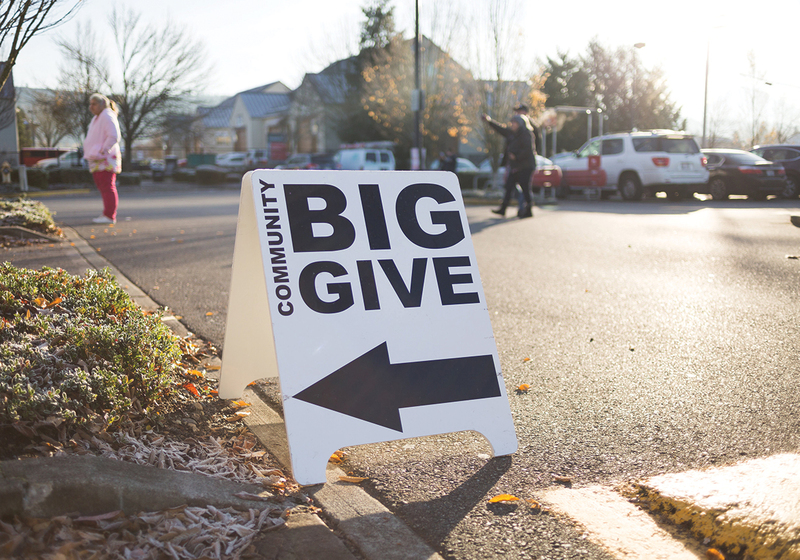 What is The Community Big Give? 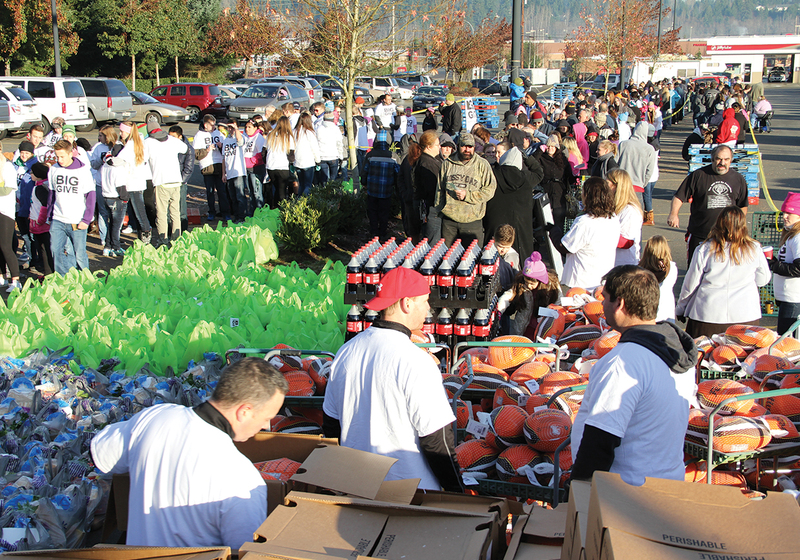 COMMUNITY BIG GIVE is an annual event, held the Saturday before Thanksgiving. On this day we distribute groceries to targeted families in need within our community who have received vouchers through their child’s school counselor or your local food bank. 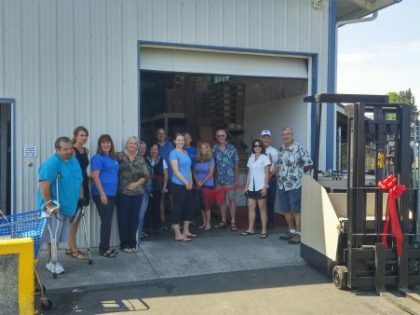 This year it’s 500 meals in Bonney Lake and 500 in Sumner. 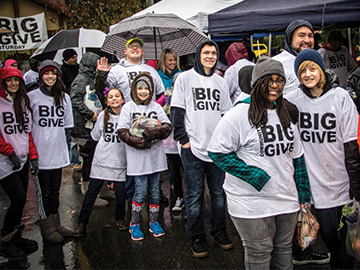 BIG GIVE is on Saturday, November 23rd, 9am to 10am. If you have a voucher, you have a meal awaiting as long as you arrive prior to 10am at which time we open the meals to all. Make sure you show up to the location indicated on your voucher. Everything will flow quickly, no need to reserve a space in line. If you are there between 9am and 10am with a voucher you will have a meal waiting for you. Those coming for the 10am portion without vouchers will be waiting in hopes of extra being available, which did exist last year (especially in Sumner). How do I get groceries? Vouchers for the 500 meals in your community will be distributed by school counselors and the Food Banks. Those with a voucher are guaranteed a meal on the 23rd of November, from 9am to 10am. At 10am we will give meals to those in need who do not have vouchers until all of our meals have been distributed. We do not guarantee that there will be extras, but we do anticipate some which will be first come first serve as supplies last. There will be a line formed when we begin for the potential meals at 10am. Go to the Volunteer page and fill out the form. Someone from our Big Give team will contact you with details. 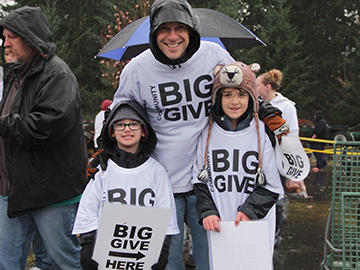 You can also contact us at BigGive@OpenLife.church or 253.987.6778 for additional questions. What will each family meal contain? 15lb. frozen Turkey, dinner rolls, can of corn, olives, 2 cans of green beans, cranberry sauce, gravy packet, 5 lb. bag of potatoes, box of stuffing mix, onion, celery, margarine, pie (or mix & pie shell). You figured us out…there is none! 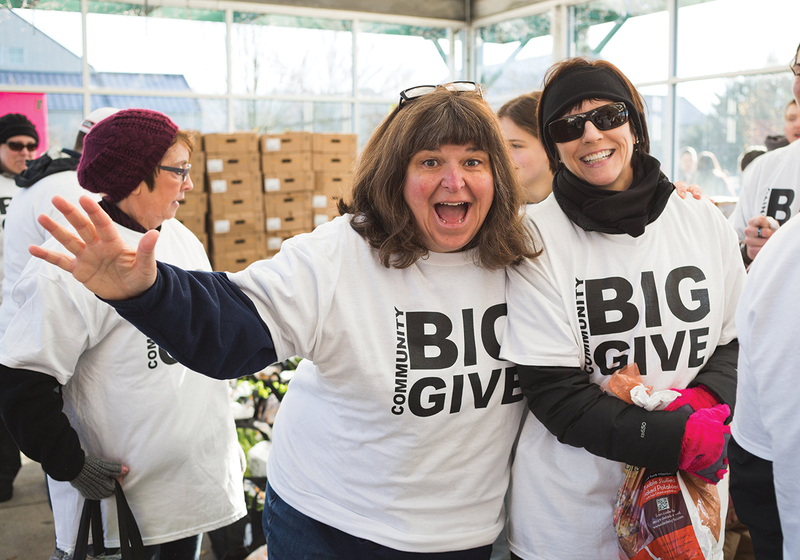 The Community BIG GIVE exists to Make a Difference in the lives of families in our community. We value you and want you to feel value and be blessed this Thanksgiving! "Just a few nights ago, I was at a local gas station and as the gas was pumping my kids and I were watching the attendant complete some of his job duties (emptying garbage cans etc) He was working hard, but you could tell he had some physical challenges that would make his job tiring. My son (14) asked " how much would someone make doing that job?" We talked about how it would probably be tough to make ends meet doing a job like that full time. Well, out of a long line of people, guess whose groceries we got to carry? It was nice to connect with this man, hear a little about his story and bless him with a meal. He and his wife (also with physical challenges) were very grateful! Thanks for helping those who live and work in our community!" "Towards the end of the rush, one lady and her daughter came to get food. Being it was my turn to help, we took her bags and the turkey to her car. When she went to unlock her car, she noticed her car battery died and that her lights were left on. I had jumper cables in my car, and offered right away to help her. I went back to the check in stand to check out, that way I could help give her car a jump. I drive over to help her, and notice she got her car started. She was so thankful that I not only donated my time for community service hours to help people In the community just like her, but that I went out of my way to help give her car a jump. She insisted on giving me a hug for the help. She got food for her family and I got the experience to help someone out. What a great time." "We helped a woman and her little boy to their car. She couldn't believe that she received a "whole meal" and said she didn't know what to expect but that she was relieved to see she didn't need anything else. Our son came home from India last May and my husband and I were excited to make this his first volunteer opportunity (he's four). I wasn't sure how it would workout bringing him, but everyone was welcoming and encouraging of his participation. Allowing children to serve others is a such a powerful thing and we appreciated the feeling of community. That evening at dinner he told his grandparents that, "Parks went to help people outside." Love."